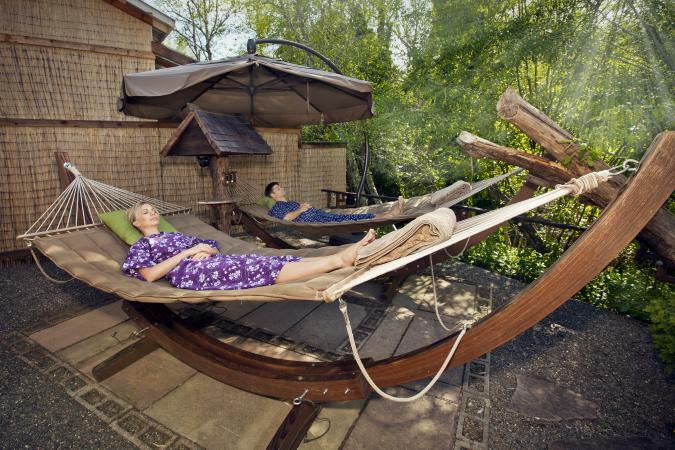 Feng shui, the ancient Asian art of placement and energy enhancement, has a trendy new 21st-century life. Traditional feng shui is a complex and arcane system. But modern feng shui, adapted for Western consumption, merges the esoteric with the contemporary for broader acceptance and application. Modern feng shui is often defined as the BTB school, the Black Sect Tantric Buddhist School of Feng Shui, developed by Professor Lin Yun in the late 20th century. BTB and other similar modern systems simplify the use of the feng shui bagua, the energy map that is applied to a home or workspace, to highlight areas that strongly affect health and wellbeing. In traditional or classic feng shui, the bagua is applied after taking the compass direction of the front door. In modern feng shui, the bagua always aligns with the front door in the same way. The wealth corner is always in the upper left quadrant of the building or room in relation to the front door. The relationships (love and marriage) area is always upper right. A modern feng shui practitioner may look for allergens and chemicals in construction materials or in the environment that can affect health and wellbeing as well as the presence of EMFs (electro-magnetic radiation). The modern assessment acknowledges that you may not be able to reposition or sell your home or office just because it does not have the support of a mountain or land rise at its back, or might face the sharp corners or roof angles of a nearby building (poison arrows). So, ancient remedies for less than ideal conditions are recommended as a practical solution to improve energy flow. Classic or traditional feng shui is roughly separated into three schools -- although they tend to overlap -- and modern feng shui borrows heavily from all three. The most ancient feng shui practice, developed before the Chinese invention of the magnetic compass, is known as the Form School. Around 3300 BCE, a tribal people invented the system of Eight Trigrams seen today as the feng shui bagua. Before and after that, the ancient Chinese looked at the topography of a site and the perceived flow of chi. Eventually, they used the concept of yin yang to refine ideas about how and where to locate homes and fields to increase their harvests, safety, health, and prosperity. Form School practitioners now consider natural formations such as hills and rivers, buildings, fences, roads and other features of the environment when analyzing the feng shui of a site. Modern feng shui may evaluate the external site but is usually more focused on the flow of chi in the entry and interior of the home or business. 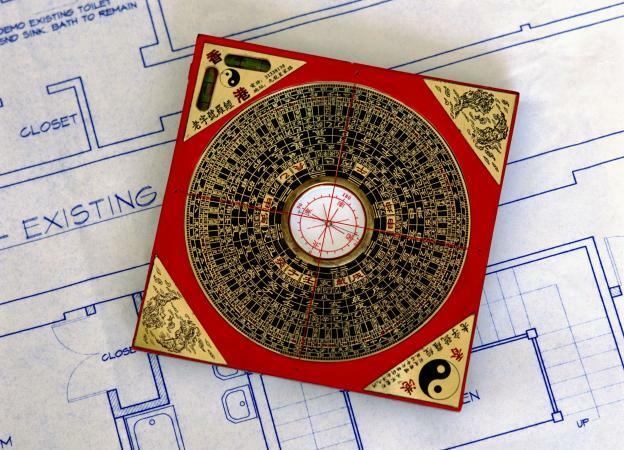 The Chinese invention of the magnetic compass led to the Compass School of feng shui. This method is full of calculations, and central to those is a careful record of compass bearings. This determines how the map (or bagua) is applied to a location, using magnetic compass directions. 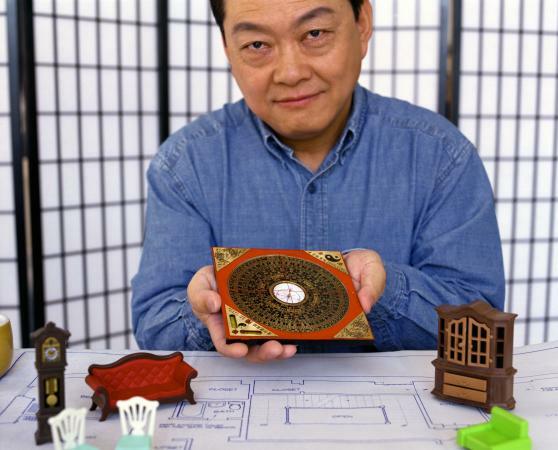 The Compass bagua is divided into Eight Houses or Eight Mansions, based on eight trigrams and similar to the bagua map used in modern feng shui. Modern feng shui aligns its bagua, with nine areas (Health is at the center), with the front door of the house or building. It does not use compass readings; the auspicious areas of the property are always the same in relation to the main door. The Compass School, unlike Flying Star, does not take into account the effect of time on a building (when it was built, when it was occupied). Some people feel this makes it a less precise way to track the energy flow of a site. Flying Star is usually considered a branch of Compass School. It presents itself as a powerhouse of calculations based on occupant's birthdate (and Chinese astrology), specific compass bearings, (using the Luo Pan, the Chinese compass), and other details of the site. Flying Star includes all time measures in determining the optimal energy patterns of a site. Adherents consider it to be the strictest, most accurate and long-lasting method of feng shui. Modern feng shui may refer to Chinese astrology at the discretion of the practitioner, but it does not require time measures, astrological data, or compass bearings for its calculations. Contemporary or modern feng shui is easier to grasp because it fuses aspirations with classic methods to discover and direct the chi or energy, usually within a home or office. BTB and other modern feng shui practices typically include analyses using more than the bagua. The five elements (water, fire, metal, earth, and wood) and how they affect each other are part of color choice and decor calculations. Each element corresponds to a direction (North, Northeast, South, etc.) and an area of the bagua. So the elements amplify the aspirations in their particular bagua and directional areas. And each element has its auspicious colors which boost specific energies even more. Modern feng shui may incorporate client birthdates and the surrounding environment but complex formulas are a choice of the feng shui expert, not a feature of the system. Whether you feel most comfortable with traditional or modern feng shui -- or a hybrid of several styles -- the goal is to maximize free flowing energy in your environment and remove all obstacles to your health, prosperity and wellbeing. A feng shui consultation should result in a pleasing and low-stress setting that is easy to keep uncluttered and encourages positive chi to circulate without impediments. In the end, you should select an expert or style that mirrors your own taste and sense of "rightness" about the energy in your space. Go modern or go traditional, but go for the best environment you can create to enhance all the good fortune in your life.